Chanukah traditions Chanukah treats . The Talmud states that when Adam noticed the days getting shorter in winter, he said: “Woe to me, perhaps because I have sinned, the world around me is being darkened and returning to its state of chaos and confusion.” So he began an eight-day fast. However, as time passed and he observed the days getting increasingly longer, he said: “This is the world’s course,” and he set forth to keep an eight-day festivity (Avodah Zara 8a). Adam is not alone. Throughout history, many cultures have marked this time of the year with celebrations of light meant to illuminate the darkness of the solstice and encourage the return of the sun. The festival of Hanukah may have roots in these ancient rituals, but the light we commemorate with the hanukiya is the spiritual light of renewal born of the victory of the Maccabees over their oppressors. And let's not forget the food. 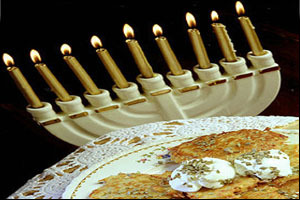 Many of the gastronomic traditions of Chanukah are quite well known. We eat foods fried in oil ---- such as potato latkes and doughnuts ---- to commemorate the miracle of one drop of oil lasting for eight days. We also play dreidel , with foil covered chocolate Gelt as booty. It is a less well-known custom to eat dairy dishes on Chanukah in remembrance of a victory that took place through cheese. During the time of Maccabean revolt, Greek officers were given license to violate every engaged Jewish girl before her wedding day. According to the legend, a Jewish maiden named Judith, daughter of Yochanan the high priest, fed the commanding officer, Holofernes, lots of salty cheese, then gave him wine for his thirst. He eventually fell into a deep sleep, giving her the opportunity to cut off his head! When the Greeks realized their leader was dead, they fled. It is also a tradition to have a festive meal on Chanukah --- by some rabbinic opinions, it is a mitzvah. It is also forbidden for anyone to fast during the festival --- it is even forbidden for brides and grooms to fast on the night preceding their wedding. The following festive meal has many of my family’s favorite traditions and treats. I pass them on to you with wishes that this Festival of Lights brings you joy. Until we eat again . . .
Lisa Kelvin Tuttle has professional experience in the gourmet, catering, and health-food fields, as well as being an experienced kosher camp cook. Her greatest pleasure, though, is cooking Shabbos dinner for family and friends. She is Communications Director for the Jewish Reconstructionist Federation and resides with her husband, Alan, and sons Adam and Jeremy in Wynnewood. This flavorful soup works beautifully with noodles, matzoh balls, or knaidlach. It is our family’s vegetarian answer to chicken soup. If you can find dreidel-shaped or Magen David-shaped pasta, these make a whimsical addition. Put vegetables in an 8-quart soup pot and add water and consommé powder or liquid stock to cover. Bring to a boil, then turn down the heat to a simmer. Rinse and coarsely chop the fresh dill and add to the pot. Let soup simmer until vegetables are soft (about 1 to 1 ½ hours), then add soy sauce and other seasonings to taste. Puree half the soup in a blender in batches or use an immersion blender until soup is slightly creamy with lots of vegetables left intact. A Middle Eastern twist on the traditional Fettuccine Alfredo, this savory pasta dish in a not-too-rich creamy sauce is sure to please any guest. Just go easy on the wine! Cook linguine in salted water until al dente, drain well and set aside. In a medium saucepan, mix cold milk, flour, butter or margarine and seasonings. Whisk flour into the milk until flour is completely incorporated. Stir with a wooden spoon over medium high heat until mixture begins to boil, then turn down heat and simmer until sauce thickens. Cut feta cheese into 3/4 inch cubes and add about 4 ounces to the white sauce, reserving the remaining 2 ounces for garnish. Add the frozen peas to the sauce and stir over medium-high heat until most of the cheese has melted and peas are bright green and cooked through. Transfer cooked pasta to a decorative serving dish, pour the sauce over it and toss pasta with sauce. Sprinkle remaining feta over the pasta and serve with freshly grated parmesan cheese if desired. Though the potato wasn’t available to Jewish cooks until Pizarro’s conquest of Peru almost 1,700 years after the rededication of the Temple in 165 B.C.E., to Jews of Ashkenazi descent, potato pancakes fried in oil are the food most associated with the holiday. This simple, delicious version --- made with no flour, so those with wheat allergies take note, and fried in olive oil --- comes from The Gourmet Cookbook, the best recipes of Gourmet Magazine. This recipe makes a dozen large latkes. Peel potatoes. Coarsely grate on large teardrop-shaped holes of a box grater, then transfer to a large bowl of cold water. Soak potatoes for 2 minutes, then drain well. Wrap grated potatoes and onion in a kitchen towel and twist and squeeze tightly to wring out as much liquid as possible. Transfer potato mixture to a bowl and stir in the egg and salt. Heat ¼ cup oil in a 12-inch skillet over moderately high heat until hot but not smoking. Working in batches of 4 latkes, spoon 2 tablespoons of potato mixture per latke into the skillet, flattening and spreading each one into a 3-inch round with a fork. Reduce heat to moderate and cook until undersides are browned, about 5 minutes. Turn latkes over and cook until the other side is browned, about 5 minutes more. Transfer to paper towels or brown paper bags to drain and season with salt, then transfer to a wire rack set in a shallow baking pan and keep warm in oven while you cook the remaining latkes. Add more oil to the skillet as needed. Serve with sour cream and applesauce. I discovered this recipe years ago in the Chanukah section of Marlene Sorosky’s wonderful Fast and Festive Meals for the Jewish Holidays, and it quickly became a tradition in our family. My mom loved these so much that before each of my visits west, she would say, “Don’t even come if you’re not bringing Meshuganeh Mandelbread!” Again, I’ve doubled the original recipe. If you’re expecting a lot of company, you might even consider baking two batches. Don’t count on any leftovers! Combine first nine ingredients: sugar, oil, eggs, orange juice concentrate, orange extract, flour, baking powder, salt, and orange peel. Beat until thoroughly blended in the large bowl of an electric mixer. Fold in chopped nuts, cranberries, and chocolate chips or chunks. Spoon two equal portions of dough side by side the short way on an ungreased cookie sheet (preferably of the air-cushion variety), patting the dough into two long rectangles about 10 inches long by 4 inches wide, about 1 inch to 1 1/2 inches high, and 2 to 3 inches apart on the baking sheet. Mold as you would a meatloaf, slightly higher in the center with tapered edges. For best results, wet your hands lightly with cold water, since dough is sticky. Dough will appear shiny. Bake for about 25 minutes or until golden. Remove from oven and let cool about 10 minutes. Then, using a sharp knife, slice on a slight diagonal into ¾ inch-wide slices and redistribute slices between 2 cookie sheets and bake on two center racks for an additional 8-10 minutes, rotating sheets halfway through. Be careful not to let the slices get too dark. Remove from oven and cool completely before serving. These traditional Israeli Chanukah doughnuts are usually served plain or filled with jelly. Here I substitute Nutella chocolate-hazelnut spread. For a pareve version, you can also use the cocoa spread found in the kosher section of many supermarkets. This tried-and-true dough recipe is from Spice and Spirit: The Complete Kosher Cookbook, published by Lubavitch Women’s Cookbook Publications. Place yeast, water, and sugar in a small bowl. Allow to stand several minutes until bubbly. In a large mixer bowl place eggs, oil, sugar, milk or nondairy creamer, vanilla, and grated lemon peel. Add yeast mixture. Add flour until soft dough is formed. (Dough need not be dry; it should be softer than challah dough.) Knead for a few minutes. Cover and allow to rise until doubled in bulk, about 1 to 1 ½ hours. Roll out dough 1/2-inch thick on floured surface. Cut out circles with a doughnut cutter or the rim of a drinking glass. Place 2 or 3 inches of oil in a 2-quart saucepan and heat over a medium flame until hot. Place four doughnuts at a time in the oil. Brown on one side and then on the other. Remove with slotted spoon. Drain and cool on paper towels. Spoon the Nutella or cocoa spread into a large reclosable plastic bag and push it to the corner. Snip off a tiny corner of the bag. When sufganiyot are cool enough to handle, make a small incision on the side of each one and pipe the filling into the center. Dust with confectioners’ sugar. These are fun to make with kids. Using a mix adds to the convenience and makes a speedy dessert on the day you make your latkes. Brownie batter, from scratch or a mix. 3 ounces cream cheese, or Tofutti mock cream cheese, softened. 24 milk chocolate or dark chocolate Chanukah candy coins, with foil removed. Line miniature muffin tins with mini foil baking liners. Spoon in a tablespoonful of your favorite brownie batter into each liner. Using two teaspoons, transfer a small dollop of softened cream cheese in the center of the batter. Top cream cheese filling with a chocolate coin and then cover with another tablespoonful of brownie batter to almost fill muffin cups. Bake for about 15 minutes, or until done according to the brownie recipe. Be sure not to let them get too dark. Cool on a wire rack. While still slightly warm, push another chocolate coin sideways into the muffin and serve.